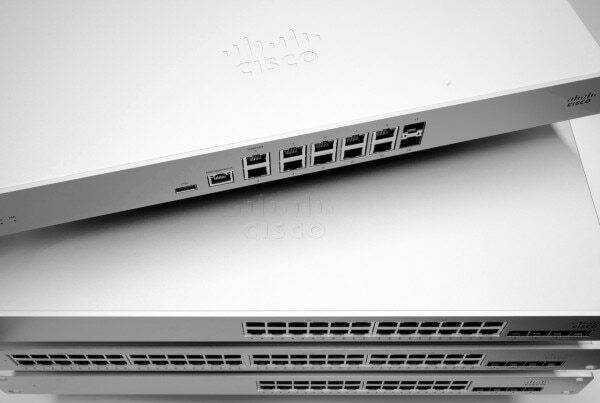 Cisco Meraki released their new line of cloud-managed, layer-3 switches this week in the MS350 series. This new family of switching can be physically stacked up to eight time for a total bandwidth of 160 Gbps. Management for both stand-alone and stacked deployments continues to be handled through Dashboard -- Meraki's cloud-based management interface. As internet connections continue to grow faster, switching technology needs to keep up in order to deliver those increased speeds across the network. Additionally, network up-time is more important than ever before for most businesses. Both of these realities prompted Meraki to develop a switching solution that meets these growing needs and accommodates physical stacking in addition to virtual stacking already available in their MS320 line. With a CPU and memory upgrade, the 350 series supports higher device counts and the performance demands that come with them. The new line of switches includes 24 port and 48 port variants with and without power over ethernet. Meraki also announced the MX84 - a 2x performance and capacity boost from the MX80 security appliance. On top of that, the port count is up, including two dedicated WAN ports, 8 ethernet ports, and the addition of two SFP ports for fiber. Furthermore, in an effort to better support dual-wan functionality, Meraki has also announced support for dual-active VPN connectivity and Intelligent WAN (IWAN) features. With Meraki IWAN, customers will be able to configure MX devices to support automatic policy-based and performance-based routing decisions, ensuring more demanding applications get the bandwith they require, and seamless fail-over if a VPN connection happens to be dropped. These releases from Meraki continue to illustrate the brand's ability to meet the demands of today's networking challenges in terms of hardware, while maintaining the ease of management software solution in Dashboard they are so well-known for.